Many years ago, an author by the name of H.G. Wells wrote a novel called The Invisible Man which also inspired a 1933 movie of the same title. Today, you can revisit it on The Invisible Man Slot, an innovation by NetEnt. It is made up of 5 reels and 20 paylines, playable at Wicked Jackpots. It is a science fiction story which offers lots of entertainment! It happens in a laboratory where you can see the reels framed in an art deco style. The symbols found on them are Arthur Kemp, Flora Cranley, Dr Cranley, Mr and Mrs Hall, A, K, Q, J and 10. Join the saga using any kind of device at Wicked Jackpots! 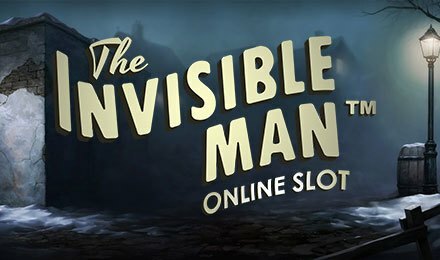 Get started on The Invisible Man Slot by selecting a betting level on the Level display. Pick one of the coin values using the + and – buttons. You can also place the highest stake in just a click with the Max Bet option. Simply click on the Spin button to start the game. As for the Auto Play feature, it lets you select 10, 25, 50, 100, 250, 500, 750 or 1000 automated rounds which play without any intervention. Bet Levels: Up to 10 levels are available. Amount of Paylines Selection: The 20 paylines are fixed during the game. Coin Values: The following coin values are at your disposal: 0.01, 0.02, 0.05, 0.10 and 0.20. Two Wilds are found on The Invisible Man Slot, such as Police Wild and Griffin Wild. Both substitute for any symbol to complete a winning combination. Police Wild lands on reel 1 and moves one position to the right when a Re-spin starts. As for the Griffin Wild, it appears on reel 5 and moves one place to the left at the beginning of a Re-spin. While both Wilds appear on reel 1 and 5, respectively during the base game, they can be seen on all the reels during free spins. Police Spins: During this feature, you can earn 3 free spins, along with 5 Wilds added on each spin. Griffin’s Rage Bonus Feature: Here, The Invisible Man visits 3 locations, namely the Lion’s Head Inn, The Mansion or Ipping Station. He chooses one of the 5 items from each location to uncover either a coin prize or a x2, x3 or x4 multiplier. If you land a red police hat, the feature is over. Don’t miss The Invisible Man Slot at Wicked Jackpots to enjoy a good time. Best of luck!